AP: Rc.No. 169/A& I/2018 Dated: 07.03.2018 Half day Schools during summer-Instructions lssued. Proceedings of the Commissioner of School Education. AP: Rc.No. 169/A& I/2018 Dated: 07.03.2018 Half day Schools during summer-Instructions issued. Sub: School Education School Academic calendar 2017 18 Half day Schools during summer-Instructions issued Reg. 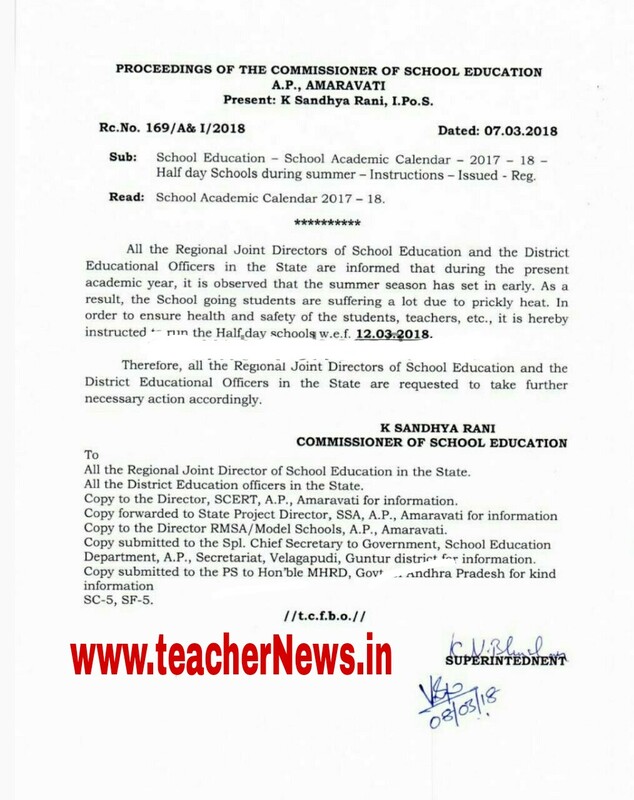 All the Regional Joint Directors of School Education and the District Educational Officers in the State are informed that during the present academic year, it is observed that the summer season has set in carly. As a result, the School going students are suffering a lot due to prickly heat. In order to ensure health and safety of the students, teachers, etc., it is hereby instructed to run the Half day schools w.e.f 12.03.2018. Therefore, all the Regional Joint Directors of School Education and the District Educational Officers in the State are requested to take further necessary action accordingly. 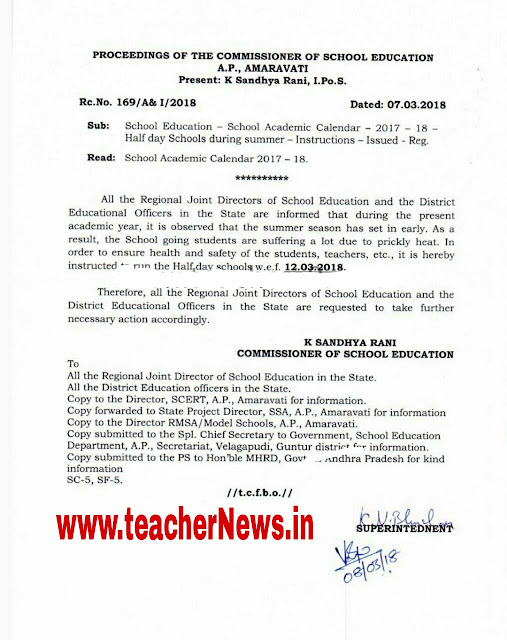 AP Schools Half Day School Starting on 12th, March 2018 as per RC 169 and Morning School Time table for Primary Classes, UP/ High Schools Timings copy download.